It is time again for the annual “Where Bloggers Create” hosted by Karen Valentine of My Desert Cottage. I would like to thank Karen for hosting this wonderful event online and the hours of work that go into it. I know we will be visiting many gorgeous studios during this event and I am looking forward to it. While I do miss having a room to myself, I love the location of our new little house and the beauty that surrounds it. I had my studio originally set up in our living room area, but I missed my Ikea Expedit for storage. While my basement has daylight windows, it is not finished and I wanted to be in the hub of our home. I also decided to purge quite a few of my supplies so they could fit into a smaller space. I truly believe that less is more now that I have done this. I do have some supplies down in the basement, but 95% are all contained in my studio area. In October 2012 we painted our bedroom again then moved the majority of my old studio items into a half of the master bedroom. I call this piece my “Birdhouse Shelf” which is one piece of a coordinating set I have. 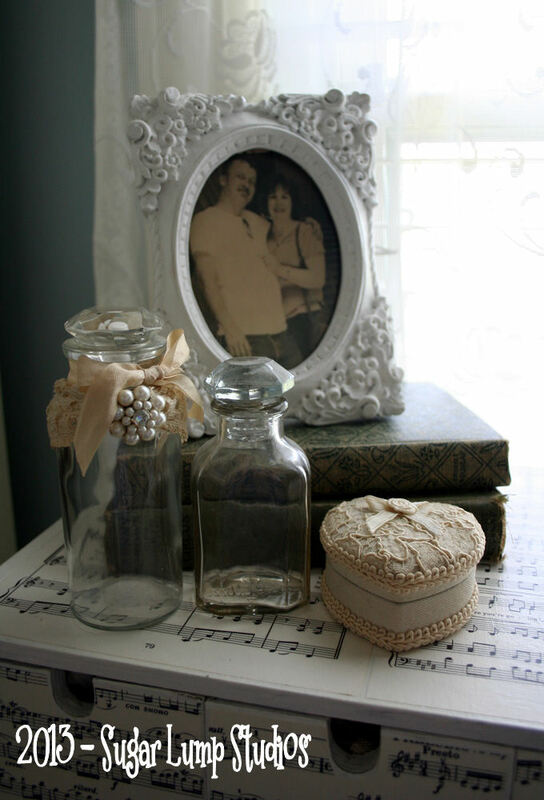 Some of the jars hold mementos close to my heart…old skeleton keys belonging to my Grandfather and lace, antique buttons that belonged to my Grandmother. Every once in awhile I open them and pilfer through to think of how old they are. The old sewing machine drawer contains a photo of my Grandfather Orla Ford taken when he was a baby in 1899. It is one of my many cherished family heirlooms. The art deco box was given to me by my Mother-in-law when she found it at a flea market. Since my wee studio area is also part of our bedroom and I also have pets, the majority of my supplies have been stored in boxes. It also helps me keep things more neat and tidy. If I have my own studio room again one day, I can’t wait to display items all over! I change the vignettes on top and inside my Ikea Expedit quite often. I love this unit! It is the most versatile and practical storage and the best investment for my studio (or a home) I have ever made! 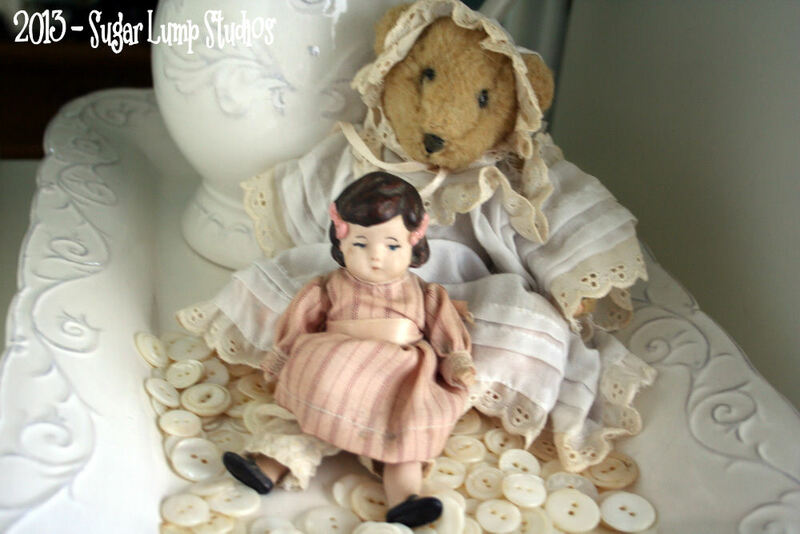 A vignette with things dear to my heart…the Steiff bear in a Christening gown was a gift to my daughter from her Great-Grandmother as a baby, a small china doll my Mom gave to me one Christmas long ago, and loose buttons…you will find button stashes all over my little space because I love them so! One of my published altered books and a Petoskey stone…they can only be found in a certain area of Michigan and it reminds me of my love for the Great Lakes. This is the back side of the Ikea Expedit shelf. 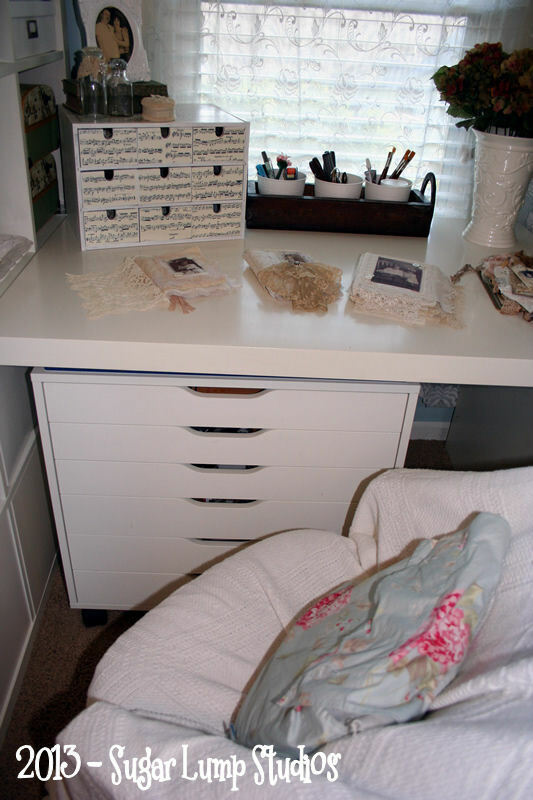 On the bottom you can see the drawers that contain my supplies and in the cubbies there is cardstock. My Alex drawers keep supplies and messes under control. Nothing pretty here – but one of the most practical pieces of storage I have ever owned…you can find them at Ikea. Paper cutters, templates, and extra tools all within handy reach…inks, glitters, and various stamping supplies…paper punches and a divider box filled with embellishments…larger collage images to pilfer through and find something to create with…and some of my rubber stamp collection. A side view of the studio area…the garland over the window displays some of my favorite cabinet cards and hand-made hearts. A small antique table that belonged to my Great-Grandparent’s holds my sewing machine and a few other odds and ends. 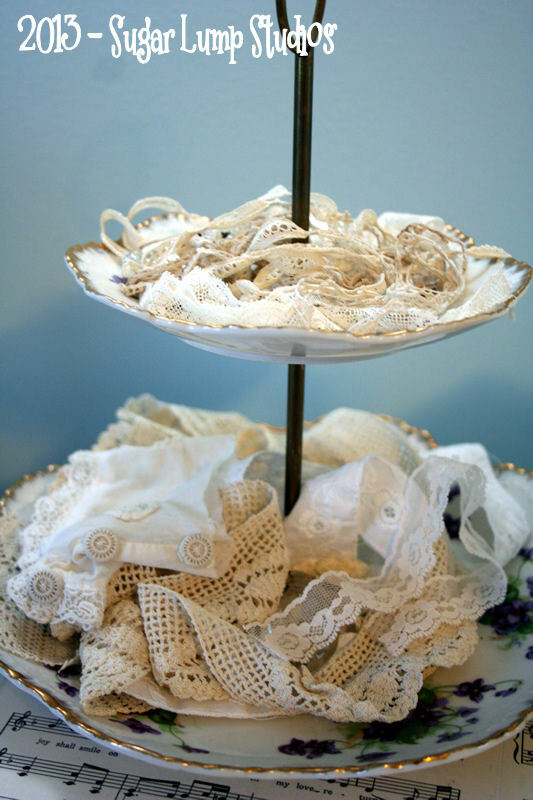 This little cake tier was another family heirloom from my Grandmother’s china cabinet. She knew I loved purple like her and shared special pieces with me before passing away in 1985. 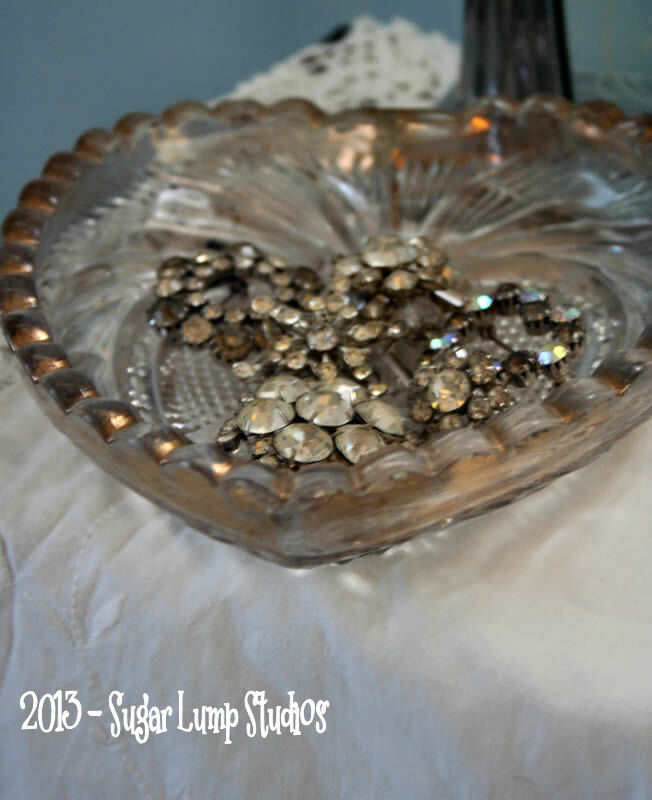 A heart shaped carnival glass bowl holds a collection of vintage rhinestone scatter pins. The bowl was given to me by my Grandmother-in-law who has since passed away. Thank you so much for stopping by to visit my “wee” studio space. 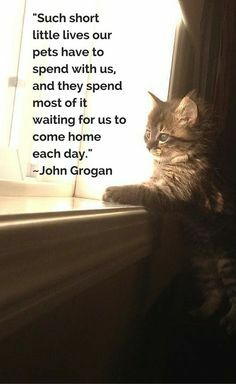 I love spending time here and hope you did too! 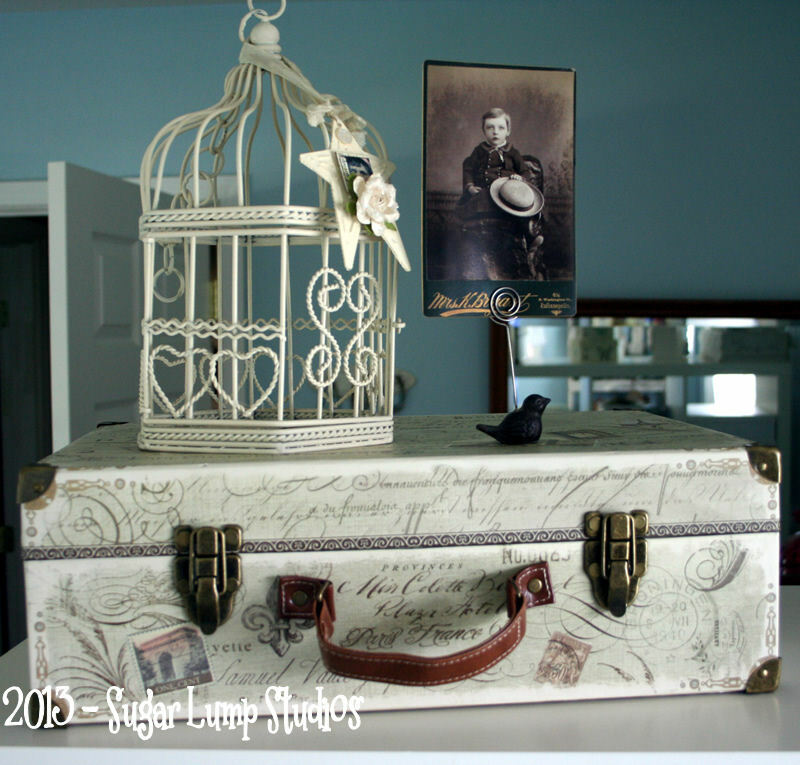 I can’t wait to visit the other creative spaces during “Where Bloggers Create 2013”! Your art studio has really turned out well! I love that you found more space for yourself. You do have a great basement though, lots of light. But I know what you mean about wanting to be around the heart of the home. Everything looks so neat and tidy. I think you have such a lovely sweet style. The bucket for the old papers is fab. And I love that scale! All your art looks perfectly displayed as well as your most treasured family heirlooms. 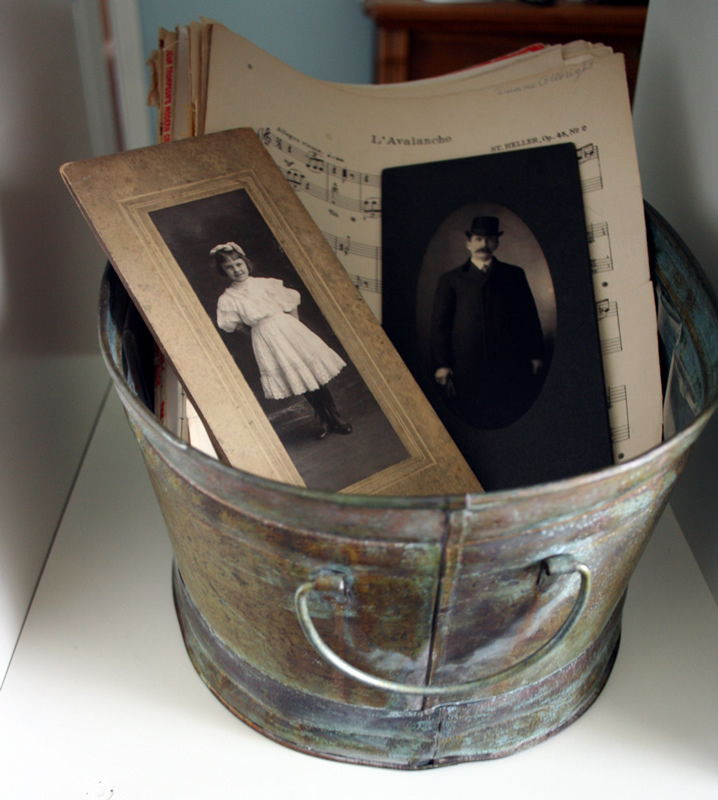 Your family memorabilia really adds warmth and love to your space. Thanks so much for letting us peek into your drawers and cubbies! 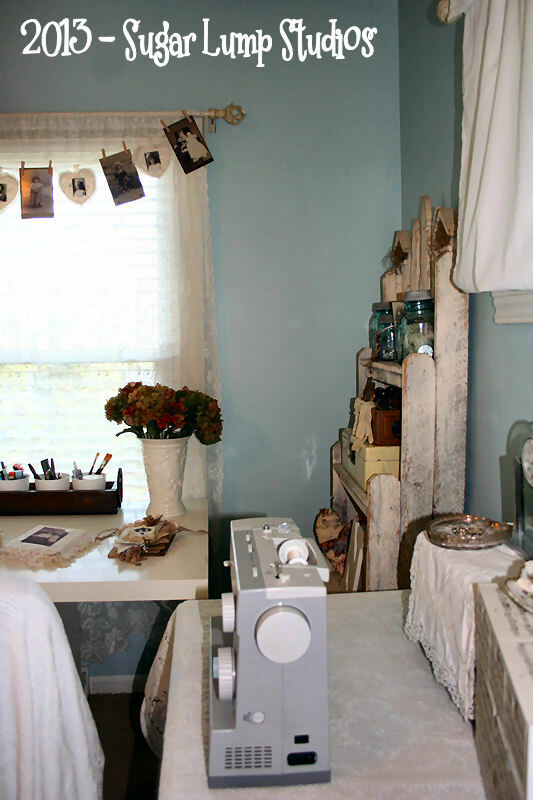 I love how you incorporated your studio into your bedroom. I really need to organize in mine, and you’ve given me many awesome ideas! What a stunning art studio you have – SO many beautiful things! 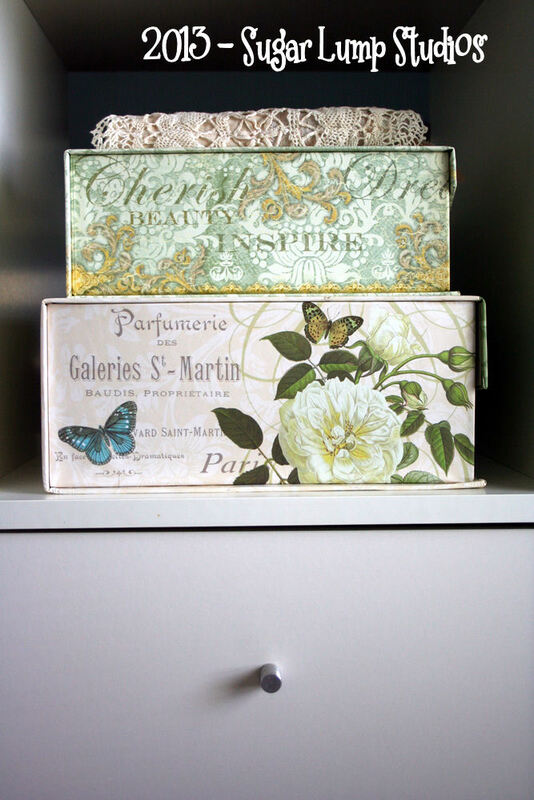 I love your ideas and your love of lace and beautiful boxes, which I also share! My post is also up – please stop by for another “Early Bird” tour! You and your beautiful art room are so inspiring and beautiful dear Nancy. thanks so much for sharing with so much to admire and enjoy. Thank you for sharing your beautiful and well organized space with us. It is amazing how little space we need really as long as we have enough storage space. I love that you use all of your family treasures in there to remind you of your ancestry. Now I can visualise you sitting at your work desk creating your most wonderful treasures. Oh Nancy so many wonderful and beautiful things you shows, it’s very inspiring to see your creative place and it is so well organized, thank you for visiting me, wish you a lovely weekend. I absolutely love…love…love your studio…you are very organized and it’s beautiful! Such a delightfully space to be creative. pieces you do,and do so well. what a positively GORGEOUS and organized space Nancy!! How could one not be creative and happy there! What a thrill it was to step inside your “studio” and take time to absorb all the little details. Life is in the details and that is evident here with the beautiful way in which you acknowledge the love for your heritage. Gorgeous colours throughout and so beautifully organised, that is what struck me, everything has a place. My wee nook is out of control (so lucky I can close a door on it all) but I see this and it inspires. So enjoyed my time with you in your creative space. P.S. Far too HOT at the moment. 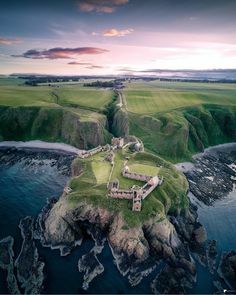 Doesn’t resemble Scotland at all lol. You studio is creamy, dreamy wonderful. Thanks for sharing your special world. Thanks for sharing. Your studio is lovely and so organized! I hope to redo my small space in the next few weeks (other de-cluttering going on elsewhere in the house right now). I enjoyed the tour! A very serene and pretty place to be creative! Hi Nancy! Thank you for visiting our studio and your kind words!!! Yes, you did indeed see a Corona typewriter. I love old typewriters but mine don’t have the wonderful history that yours does! Lucky you!!!! 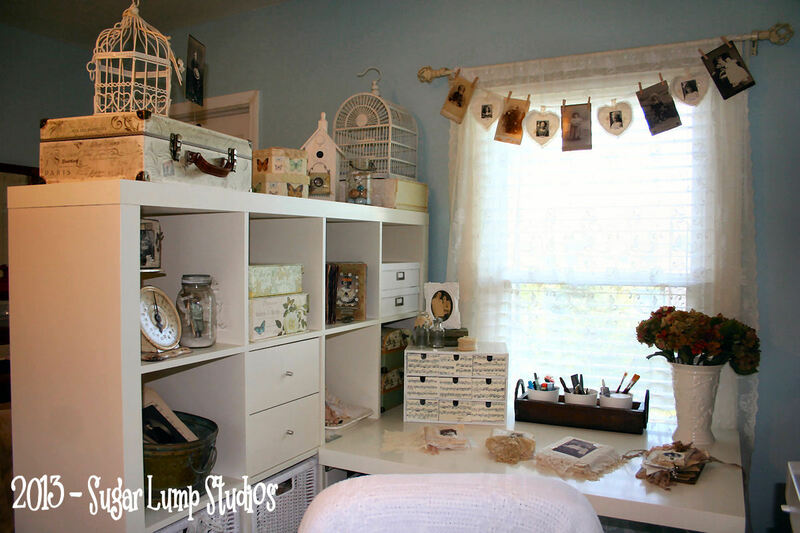 I think you really did a wonderful job fitting your creative space into your bedroom!!! 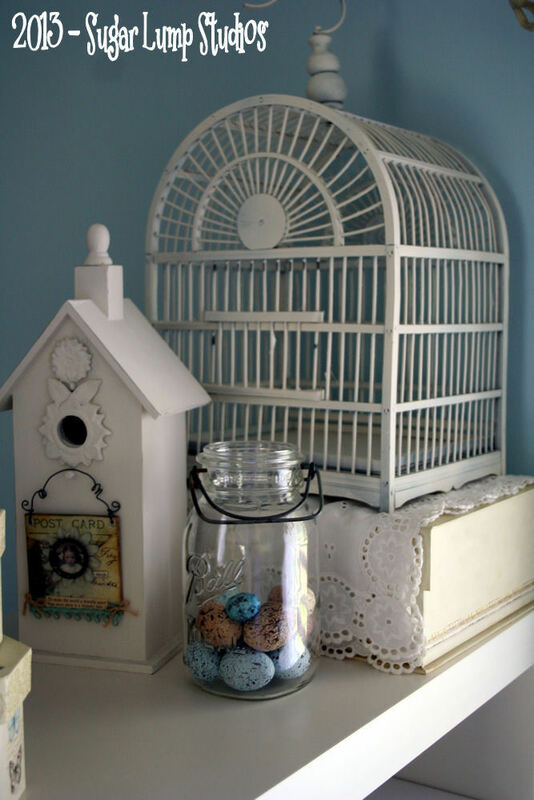 Love the colors – I have a similar blue and white theme in my bedroom as well!!! Such peaceful colors, I bet your creative muse is inspired by the color alone! And Ikea?!?! Oh my GOSH! I LOVE all their storage solutions and their furniture and their small items. Yep, LOVE it ALL! I can spend a whole day in that store just wandering around. That’s where we purchased our slipcovered sofa and chairs. Best purchase ever! And I have looked at the same shelf unit – love that it can be used as a room divider AND the little drawer stack that reminds me of an architects cabinet. Thank you for sharing your creative space! Have a great weekend! 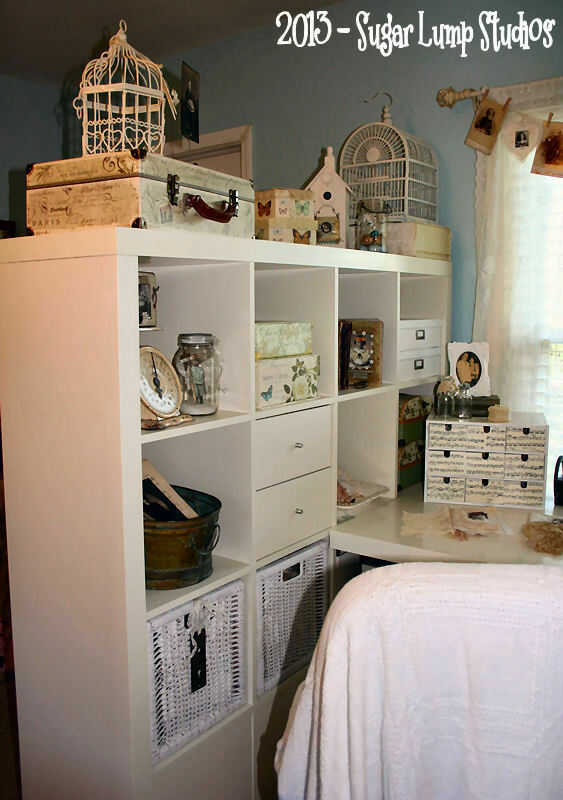 You’ve done a great job incorporating your creative space in with your bedroom, Nancy! I love that bookcase piece. It works perfectly for storage and a “wall”. I also love all the things you have displayed on it, especially the altered books. I haven’t tried those yet, but would love to. Thanks for sharing your space! Hi Nancy, Your creative space is gorgeous. I love all your special touches and creations. What a talent you are. Love the unit from Ikea. I am actually going there today. I would love to have one of those. Your studio is so cozy and inviting. 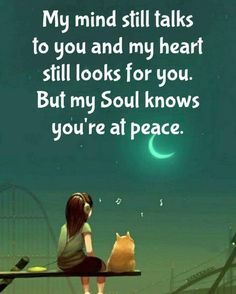 I could spend a lot of time there and I am sure you do. 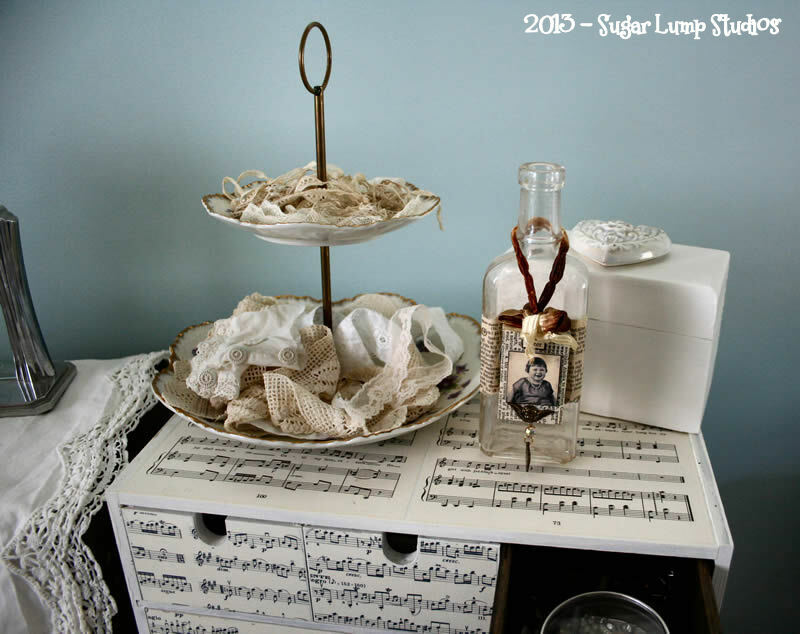 Love your jar art and the darling suitcase and the music chest of little drawers. 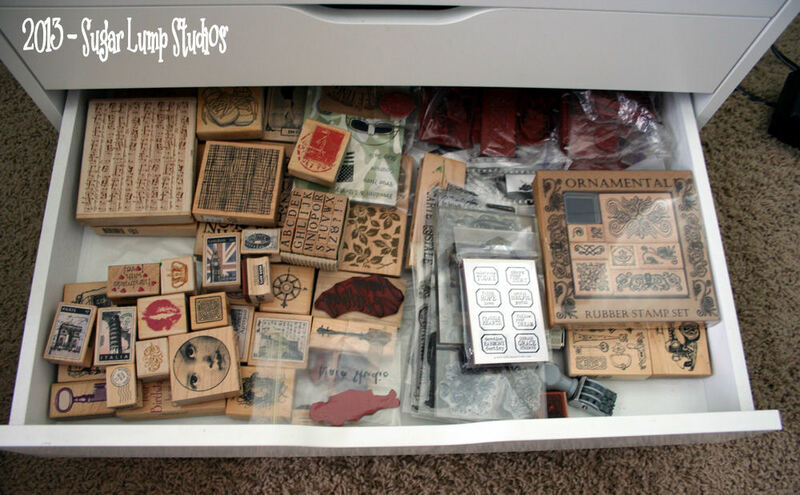 You have awesome organizing pretties. 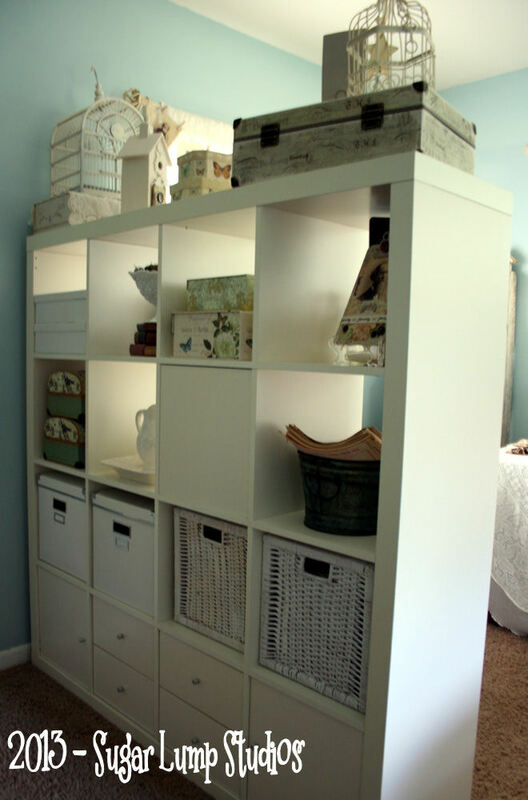 So many great ideas for storage. Thank you for sharing. Oh and I love the wall color too. So pretty with the white. Thank you for stopping by and your kind comment. Have a great weekend. I had to move my stuff back down to our basement because DH did not want to see all my stuff. I would love a cute little corner like this in my bedroom. Don’t you just love Ikea? Now I’m thinking of Swedish meatballs and Lingon berry sauce, cinnamon buns and the big breakfast! I’m bookmarking your space for future reference. I have been dreaming of the day I can Ikea-fy by craft space. I do like a cozy spot for working on projects. If I need more space – Well the dining room table is put to work. Thank you for visiting! 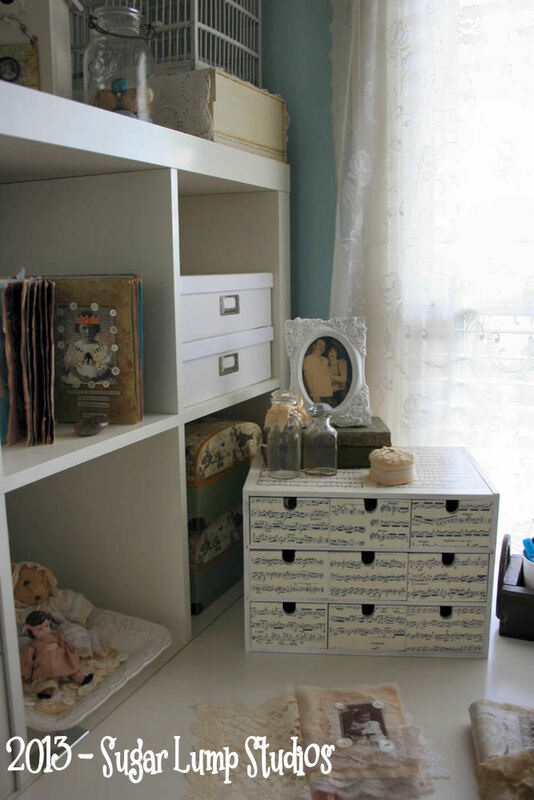 A storage lover myself, I certainly appreciate the lovely shelving, bins, drawers and trays. You know what makes them beautiful? All of the keepsakes from your family and the personal touches you’ve added. What a wonderful space. And how well you have everything organized. Thanks so much for stopping by! 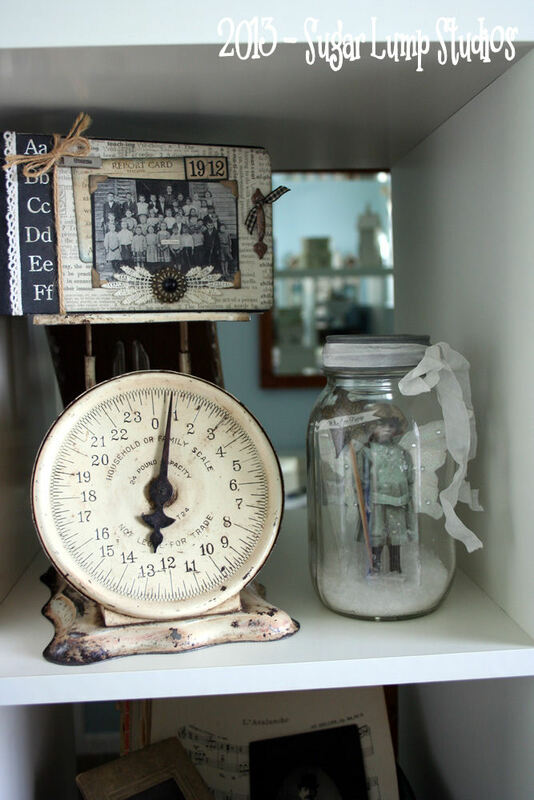 Your creative space is very well organized and filled with lots of goodies that hold sentimental memories which I adore!! A beautiful and efficient space indeed!! Thank you for sharing your beautiful little studio, Nancy. You have made great use of a small space, and arranged it to look so adorable and cozy! I love all the sentimental family touches-so precious. We are in an apartment after selling our home last year and now are looking at buying a small 2 bedroom, (homes are very expensive where I live), and I was trying to imagine what I could do with the boxes and boxes of art supplies I have in storage. 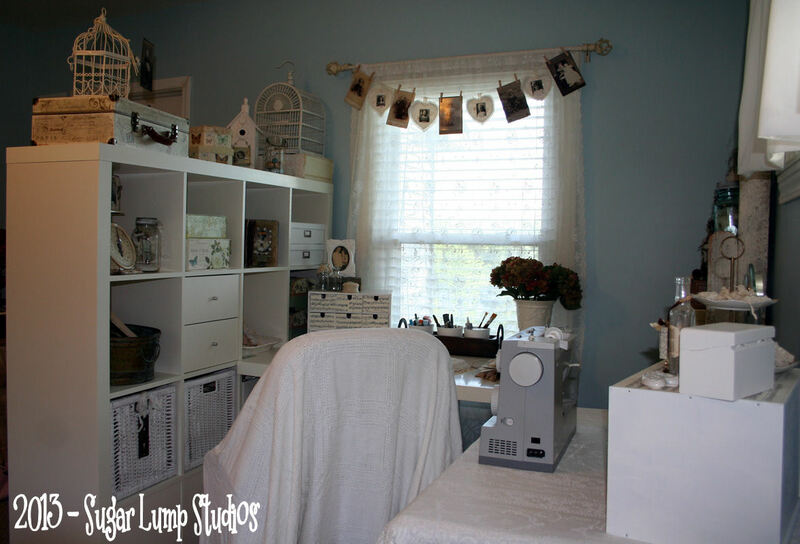 I have never really had a “studio” myself-just had all my craft stuff in a bedroom before. I will have to go to Ikea and look at their storage units. Perhaps I can get my life organized soon–you have always been a great help and inspiration to me! Oh Nancy, your room is so lovely! Everything has a place and is so neat and orderly. I could use some lessons from you. Thanks for the tour, it was so fun!!! You have done a remarkable job of utilizing your small space! I am really impressed with how functional and pretty, at the same time. Thank you for visiting my little blog today and for your kind words. Enjoy the rest of the party! What a FABULOUS studio you have. It inspires me to create. 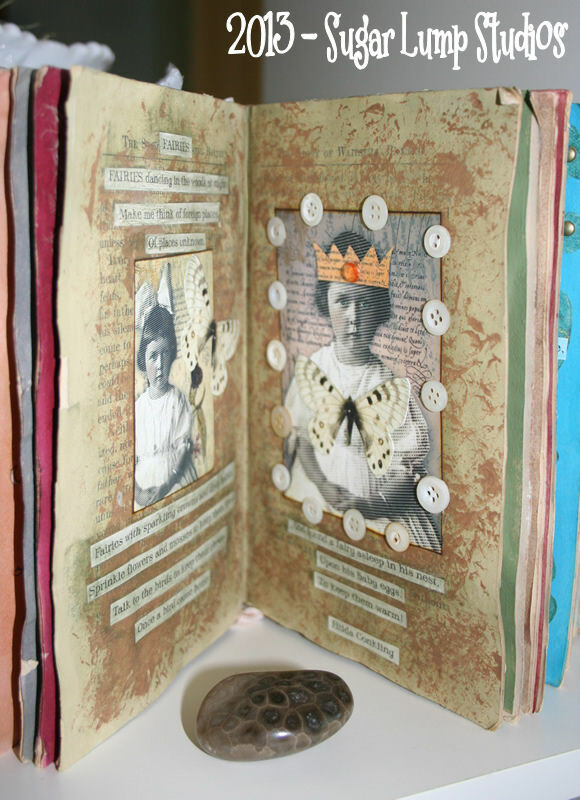 I LoVe your wall color and the Altered Book that you posted. I HAVE to make myself one. I just have never taken the time. Thank you for sharing your amazing talents! Hi Nancy, I don’t know what was wrong but I couldn’t enter your and some other webpages for several days. I’m sure it was a problem at our side and I’m glad I can finally visit you again. You have a great studio space in your bedroom and everything is so well organized. Your storage solutions are wonderful and you’ve surrounded yourself with lots of beautiful things. Thank you for sharing! I love your wee space! What a perfect example of function, beauty and organization. I think it shows just how creative you are. I love your creative space! You have a beautiful spot to create! Hi Nancy. Your creative space is beautiful. I especially like the music covered drawers. I have also just purged a lot as I prepared for my move. I agree. It felt good to share my junk with someone else! Thank you for stopping by my studio. How can you create in such a mess??? 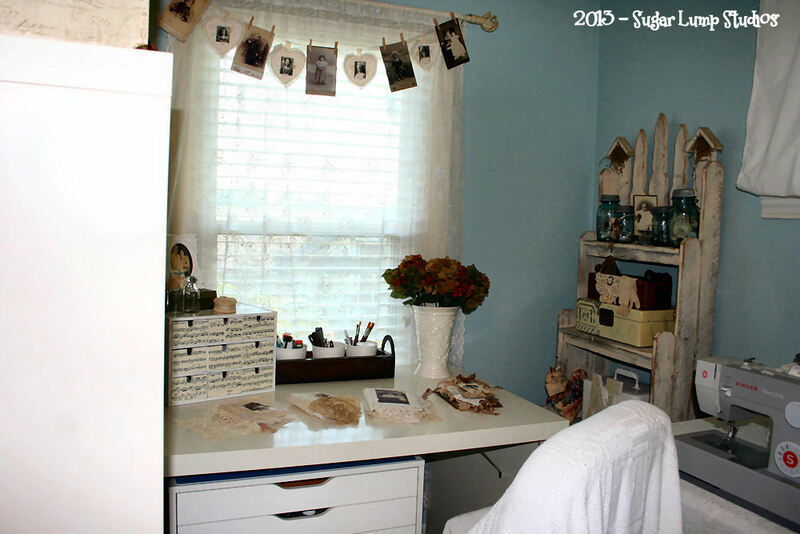 Oh how I love how neat, clean and lovely your creative space is! If you saw mine, you would be floored! Of course that is if you could find floor space! Hugs! Beautifully sweet space…. great light and I love all of your collections! Thank you so much for sharing. Take care. It certainly does not look like a wee studio space! 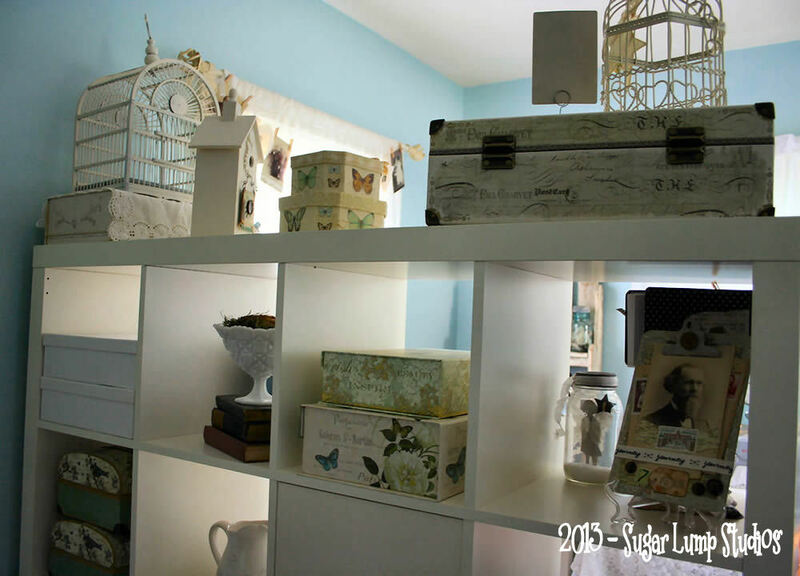 I really enjoyed peeking into your studio – you have a lovely creative space. and I love how you altered the Fira drawers. I could play in your studio for many hours! Cheers from Singapore. ps your cards in your most recent past are absolutely beautiful! Wow that’s really nice what you did with your end of the room, really beautifully sorted and displayed. Love your shelving that looks like it made of old wood fencing(?) and the lights colours and more white on white sure makes the space feel airy and light. Very nice!!! What a wonderful place you have created! 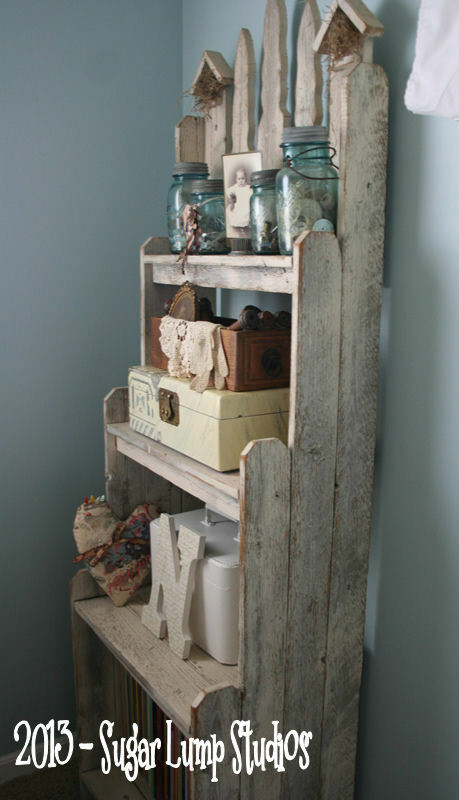 I adore the birdhouse shelf – it looks like an old picket fence! 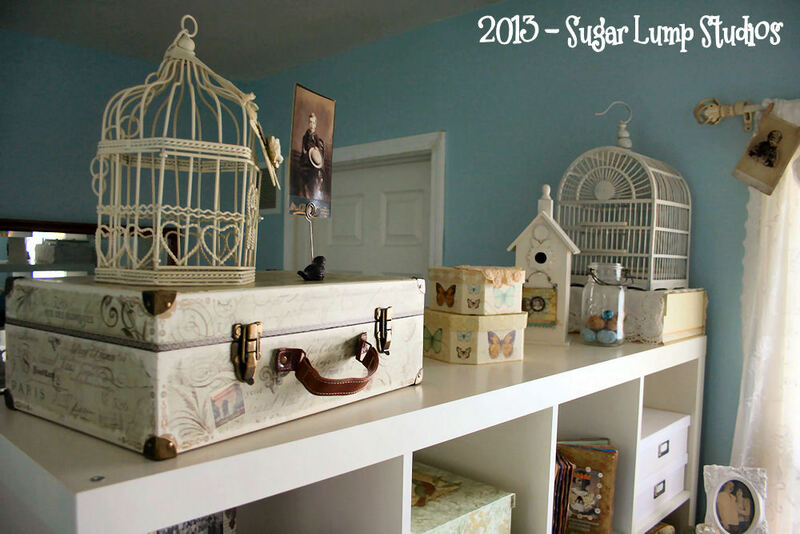 I also love all the birdhouses and especially admire that you have family treasures too. Lovely space!